Refreshingly sweet in taste, papayas are bright, pear-shaped, exotic fruits that you’ll easily find in the market throughout the year. Enclosing hundreds of black, rounded gelatinous seeds, the soft, edible orange flesh of papayas is actually nutritious, offering numerous health benefits. Here’s why you need to include these ‘fruits of angels’ in your diet. 1# Lowers cholesterol: Papayas are rich in fibre, vitamin C and antioxidants that prevent cholesterol build up in your arteries. Too much cholesterol build-up can block the arteries completely, causing a heart attack. Papaya extracts have also found to reduce lipid and triglycerides in diabetic rats . You may also want to read how to reduce cholesterol levels naturally. 2# Helps weight loss: One medium sized papaya contains just 120 calories. So, if you’re planning to lose weight, don’t forget to add this light fruit to your diet. Besides, it also packed with a considerable amount of dietary fibre that aids weight loss by promoting a feeling of fullness and controlling cravings . 3# Boosts your immunity: Your immune system acts as a shield against various infections that can make you really sick. A single papaya can fulfil more than 200% of your daily requirement of Vitamin C, making it great to build a stronger immune system. 4# Good for diabetics: Despite being sweet in nature, papayas are low in sugar content (8.3 gm in one cup of sliced papaya) as well as glycemic index. This property makes papayas excellent fruits for diabetics. The vitamins and phytonutrients present in them prevents development of heart disease in diabetes. Also, people who don’t have diabetes can eat papaya to prevent it from happening. You may also want to read how to prevent diabetes with a fibre-rich healthy diet. 5# Great for your eyes: Papayas are rich in Vitamin A and flavonoids like beta-carotene, zeaxanthin, cyptoxanthin and lutein which keep the mucus membranes in the eyes healthy, preventing them from damage. Vitamin A in them also prevents the development of age-related macular degeneration . The best thing about papayas is that the carotenoids present in them are more bio available than those present in other vitamin A rich foods like tomatoes and carrots . 6# Protects against arthritis: Arthritis can be a really debilitating disease and people who have it may find their quality of life reduced significantly. Eating papayas are good for your bones as they have anti-inflammatory properties along with Vitamin C which helps in keeping various forms of arthritis at bay. A study published in Annals of the Rheumatic Diseases showed that people who consumed foods low in Vitamin C were three times more likely to have arthritis than those who didn’t. Also read 9 ways you can fight arthritis with food. 7# Improves digestion: In today’s times, it is near impossible to avoid eating foods that are bad for your digestive system. Often we find ourselves eating junk food or restaurant food prepared in excessive quantities of oil. Eating a papaya daily can make up for such occasional mistakes, as it has a digestive enzyme known as papain along with fibre which helps improve your digestive health. 8# Helps ease menstrual pain: Women who experience menstrual pain should help themselves to several servings of papaya, as an enzyme called papain helps in regulating and easing flow during menstrual periods. Here are some home remedies to relieve menstrual pain. 9# Prevents signs of ageing: All of us would love to stay young forever, but no one in this world has managed to do it. Still, healthy habits like eating a papaya daily will prolong the process and may make you look 5 years younger than you are. Papaya is rich in vitamin C, vitamin E and antioxidants like beta-carotene which helps prevent your skin from free radical damage keeping wrinkles and other signs of ageing at bay. Here’s how you can use papaya to keep your skin beautifully glowing. 10# Promotes hair growth: Apart from keeping the skin healthy, papayas are very effective for maintaining healthy hair. Vitamin A in them is utilised in production of sebum, a compound that is crucial for keeping the hair smooth, shiny and moisturised. External application of papaya extract to the scalp can help you get rid of dandruff. The nutrients present in them help hair loss. They boost hair growth and strengthening. Although there is no scientific evidence, papayas are also thought to prevent hair thinning . 11# Prevents cancer: Papaya is a rich source of antioxidants, phytonutrients and flavonoids that prevent your cells from undergoing free radical damage. 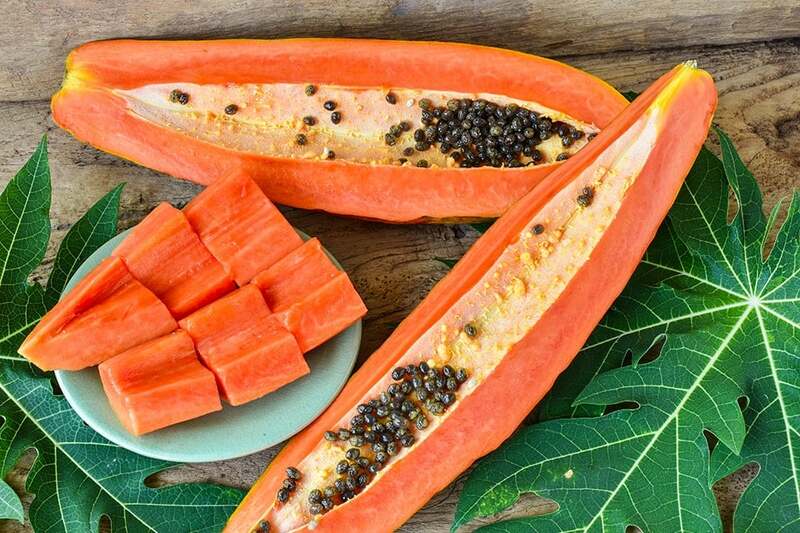 A study conducted by the Harvard School of Public Health’s Department showed the richness of beta carotene in papayas protected against prostate cancer and colon cancer growth . 12# Helps reduce stress: After working hard for the whole day, it is a good idea to come home to a plate a papayas. The wonder fruit is rich in several nutrients like Vitamin C which can keep you free from stress. According to a study conducted in University of Alabama, found that 200 mg of Vitamin C can help regulate the flow of stress hormones in rats. All of this makes papaya a wholesome fruit that is excellent for your entire body.